Part 1 (Lemuria), and Part 2, (Atlantis and the rest of the 2nd Earth). The sinking and loss of the Gaia Mother Civilization! A War only against the giants of nature, which backfires. Ment to help the Lemurians and the earlier Alanteans against rampaging of giant animals and dinosaurs, the timed strikes of the Atlanteans upon Lemurian wilderness begins a build up which leads to an apocalypse. Spring. April 1st, 52,1010 B.C. 8:00 A.M. Eastern Lemurian time: Atlanteans were now ready to use the Gamma type devices. All of Lemuria (about 6.5 billion people, remember, this was a huge continent near a peak in civilization!) was waiting on the Atlantean tech to see if this would solve their problems! Yet strangely, there was an increase of earthquakes and volcanic activity, and even the rainy weather bands of the vapor barrier/atmospheric manifold seemed much more chaotic than usual, with storms and lightning being reported. These storms were unheard of by the Lemurians and Atlanteans of this time, storms and lightning only being reported in legends of their past! Some Lemurians, after hearing the warnings about the Earthquakes and storms (this was all prior to the 20 planned detonations), made immediate plans to move out, and groups began migrating to the Gobi continent, and the (then) Island of India! At this time, the Gobi area was lush, green and forested, and was fronted then to the East by the Much larger Yellow Sea! Others migrated to islands in what would eventually become the South American continent, and also to Atlantis proper! The Atlanteans welcomed their 'big brother/big sister' Lemurians with opens arms. Much smaller scale migrations had actually been going on for quite some time. Both Atlanteans and Lemurians were feeling hopeful, in spite of the strange increasing of the Volcanic eruptions and the now torrential downpours caused by the eruptions, a few of which seemed to breach the vapor barrier! The energetics coming through the pyramids, which Lemurians used a source of power, transport, and healing, also became chaotic, and unusable. Large groups of Animals were noticed jumping into the ocean and attempting to swim away. Pets started howling or screetching, and generally acting like they wanted to escape somewhere. Spring. April 2nd, 52,010 B.C. At long last the Atlantean/Lemurian science teams finished their placements and yields of the Gamma Nuclear devices. Individually, they were all low yield, all placed in the 20 worst animal 'nest'/valley areas on the Lemurian continent. No One thought of RECHECKING THE sequencing or spacing of the fusion events and implosions. They were all timed to go implode together. THE COUNTDOWN BEGINS. April 5th, 8:00 P.M. 52,010 B.C. Central Lemurian time: Countdown Zero! The devices work as designed (they thought), with the scientists breathing a 'whew' of relief! The Media/Net announces that come morning, results should be apparent! That turned out to be and understatement, as well as a misstatement! The night from hell had begun. By 8 a.m. NEXT morning large volcanic cracks were spreading across the Lemurian continent! In the next few days, Large areas of land began subsiding, and ocean was beginning to poor in! Worst of all, in spite of offers of Atlantean help to flee (or be moved), most of the population either didn't believe Lemuria could sink, or they acted like they just wanted to 'go down with the ship'! Within 2 weeks, half the continent had water over it! The process slowed down some then, and the 'Great Sinking' actually took about 20 months to complete, leaving the Hawaiian, Easter, and many other current South west island chains above water. Two larger exceptions also stayed above water: Australia, and another larger remant Island (now gone). Small groups of Lemurians, towards the end of the 20 months, did take up the Atlanteans offer to move to Atlantis, but BY THEN, THE ATLANTEANS WERE NOW JUST STRUGGLING TO SURVIVE OVER ON THEIR OWN CONTINENT! Overall over 4.5 billion people 'went down the ship!' The far northeastern shore of Lemuria that was pushed up while the rest of the continent sank, eventually would become the far western coast (including California and southern Oregon) of the eventually formed new continent of North America (after the later Great Flood). The far southeastern coast of Lemuria that was pushed up and saved would eventually become part of the west coast of the new continent of South America (this after the Great Flood). The far northwestern coast of Lemuria that was pushed up and saved would eventually become part of what is now Japan! Yes, Lemuria was big! So at 8:00 P.M. on April 5th, 52,010 B.C. the combined science team of the Atlanteans and Lemurians detonated the Gamma Nuclear type devices, all 20 of them, upon Lemuria, to solve a problem. What they didn't know is that they just created 2 CONTINENTAL SIZE larger problems. Many months before, the Atlantean News/net had interviewed the Spiritual adepts, and the Atlantean Oracle that lived in the Holy pyramids on the far Eastern shore area of Atlantis. Both the Oracle (a type of construct) and the group of Spiritual adepts warned strongly, if not harshly, about the course of actions the Atlanteans were taking, via technology, to help the Lemurians! They also warned that the Lemurians themselves still had the power, inside themselves, to save their continent both from the rampaging animals and MORE IMPORTANTLY from other, more hidden dangers in their very land itself! They further warned, worst of all, is that IF THEY CARRIED THROUGH THE PLAN TO HELP THE LEMURIANS, ATLANTIS ITSELF WOULD BECOME IN DANGER. Finally, the E.T. 's, whose interactions with both the Atlanteans and Leumurians had long since become public and commonplace, started boarding their Air ships in Atlantis for a mass exodus that very night of April 5th! And of course, most Atlanteans ignored these 'signs', and interviews! The Atlanteans themselves at one time had rampaging animals also, the problem being solved through Atlantean technology. Some Atlanteans yawned, and some laughed at what they considered 'bad' advice to stop these 20 planned detonations! "Sheep crying in the night at shadows!" were the thoughts of most of the Atlanteans and Lemurians about the warnings of the Adepts, as well as warnings from others (including the E.T.'s). 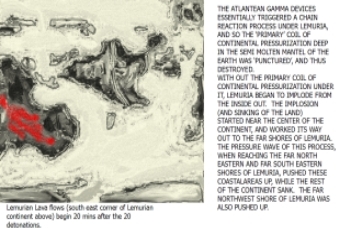 So the Atlanteans were horrified when they heard the morning report that Lemuria was now in the process of cracking, splitting apart, and sinking just 12 hours after the detonations! 3 days after the Lemurian detonations, Atlantean pets started acting crazy, like they too wanted to escape! Meanwhile, the Adepts and the Oracle were now saying, "Now it begins here". They also warned that Atlanteans living along the far southern (and also southeastern) shores (southern shore at that time one of the most populated areas of Atlantis! ), the far Southwest Isthmus (an industrial area that lead to what would become Central America), and the Far North East country (including the Isthmus that connected Atlantis to what would become the British Isles!) should ALL MOVE INLAND (or away) FROM THESE AREAS. They further warned that anyone living along the Great Central River (that ran North/South) should MOVE, and the ATLANTEAN CONTINENT AS A WHOLE WOULD NOW experience great volcanic smokes, eruptions and earth quakes, for 36 months! It turned out to be a time of hell, for Atlantis! If not the horrendous quakes, storms, slides crackings, and sinkings, there were also huge clouds of poisonous gas emitted by the Earth, which destroyed whole regions of the Atlantean continent! Many Millions of Atlanteans didn't make it through this, including several million that acted as the Lemurians did, not believing it could happen to them! The Great Atlantean Power Crystal, shifting position in a particularly violent quake, powered down, taking more than 95% of the Atlanteans grid with it in a Domino effect. It would be literally decades of repairing and realigning the Crystal before it would go 'online' again. 98% of the Flying sky Ships at the time then crashed (since they were powered by the Great Crystal). Between this event, the severe ground quakes (and coastal sinkings), 99% of Atlantean air fleet was wiped out. 85% percent of the water fleet, powered by the Great Crystal, were now depowered and adrift. Great storms and waves then destroyed over 90% (both at the docks and upon the open seas) of the Atlanteans Legendary Sailing/Water fleet, and the Atlanteans, 10 months after the detonations, had a realization: The damage to the Atlantean grid and infrastructure was so great, that the remaining Lemurians would now have to be on there own! Atlantis now had to focus all remaining resources just to make sure they would survive! The Great Waterway, in a series of above 9.5 magnitude quakes, began pulling apart. As this happened, severe upthrusts of the Earth, literally the raising of mountains, occured on both sides of the fault that had once just been a river valley! No human structure remained standing in this area, not even the megalithic pryamids. Atlantis was now clove in two, split by a now continent stretching waterway running North/South, not unlike a much longer version of the present day Red Sea. The populated and industrialized southern coast area was now under water, as were the other areas the Adepts had warned about! After 36 months, 4.5 billion people had perished on Lemuria, 2/3's of its population. Atlantis, though not as populated had lost over half of its population! (This was before the Famine that came later). And no power, no grid, very little technology working. Of course, then came the famine, and the weather took literally centuries to 'reboot' and get the vapor barrier/weather control back operational. Atlantis eventually lost over 2/3's of its population, through the above mentioned after effects. It became severe time of struggle and survival for the Atlanteans. It was if Nature had literally 'wrenched' Atlantis apart, only to slap it horribly back together, with large parts either missing or unrecognizibly altered! It was now a land of mountain chains (where before there had been none), increased volcanos and poisoness areas, and new much further inland coastal areas. The 2 areas of the country relatively intact, interestingly enough, were first: the Far Eastern temple and Holy area (around the Azores in present day), and 2nd; another known Holy area west (in the area of the Bahama's in present day) of the Great Southern shore (that had slipped beneath the sea). The low point of Atlantean civilization at this time bottomed out in 48,200 B.C. ***See article "The cyclical nature of Earth Civilizations and Intelligence! (And how to over come this Challenge!)" on Page 12!